Black is a general-purpose colour and can be used for any type of model. Brown is great for military models as well as highlighting details on bright colours such as Yellow or Orange. Gray is perfect for White or Light Gray parts where Black may be too distinct. 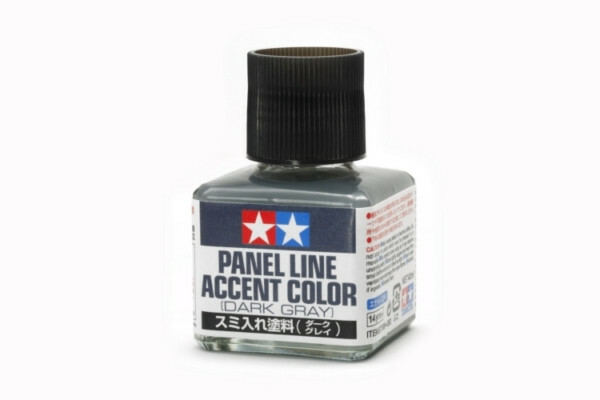 Plastic parts may become brittle when using Tamiya Panel Line accent colours. Avoid using on movable parts and take care when applying to load-bearing areas. Apply over base coat of lacquer or acrylic paint. Accent Colour paints may damage underlying base coat. Test before applying it onto the model. Take care when applying on flat base coat colours as Accent Colour paints may permeate more readily.